Captain Danny Cash and the 1sts were away to Acle. A win would guarantee themselves a place in the Premier Division for next season – but if they lost, their survival would depend on how other teams performed… Garby won the toss and put the home side in to bat and in a devastating opening spell of bowling, Kieran Pask (4-28) tore through Acle’s top order to leave them floundering on 9-3. Gavin Barnes (3-22) and Alex Hogg (2-1) joined the party and together with a couple of run-outs, Acle were all out for just 65 runs! It took just 12 overs and no wickets lost for Garboldisham to chase down Acle’s total, with Dan Constable scoring 43 and Henry Phoenix, 23, to give Garby a 10 wicket win and ensure survival in the Premier Div’. In fact, the margins in the lower end of the table were so close, by the end of the day, Garboldisham had finished the season mid table! It was a very satisfying end to the season for the 1sts after their run of bad form earlier in the summer. Last week’s win for the 2nds ensured their promotion but could they wrap up the season as Division 4 champions? They were at home and facing Sheringham who won the toss and elected to field. Garboldisham got off to the worst of starts with their first five batsmen unable to score more than single figures, but fortunately, crucial runs from Ben Buckmaster (37) and Jack Stevenson (24) in at 6 and 7 helped take the Garby total to 112 before they were all bowled out in the 29th over. It was clear that the 2nds were many runs short of where they wanted to be. However, the match developed into a low scoring thriller with Luke Rackham (4-48) taking the crucial wickets of Sheringham’s top order which swung the game in Garby’s favour. More wickets from Karl Gooderham (2-10), Sean Taylor (1-10) and Dan Philpott (3-1), who cleaned up Sheringham’s tail, saw the visitors bowled out for 104 and just 9 runs short of Garby’s total! It was a surprising turnaround for the 2nds which nicely wrapped up the fantastic season that they’ve had. The 3rds were at home to Drayton and the visitors lost the toss and were put in to bat and scored 190-9 in their 45 overs. Pick of the Garby bowlers was Rowan Freake with 3-34. In reply, a super 65 not out from Toby Culling and 70 from Jon Olpin helped Garby to 191-3 and a 7 wicket win in the 36th over. 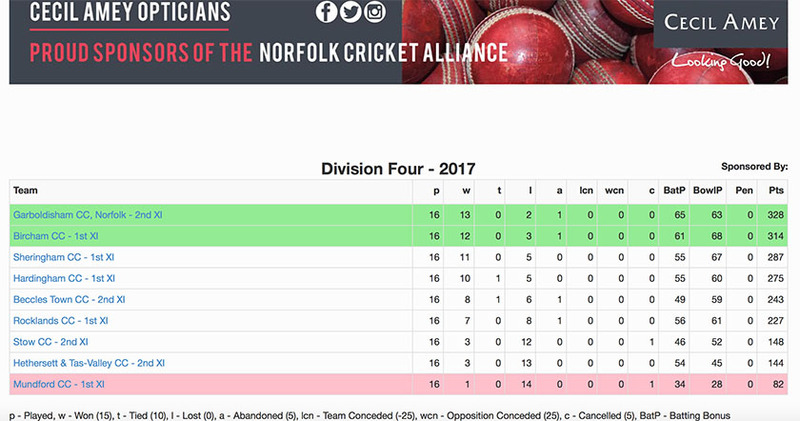 The 3rds finish their season 4th from top in the Norfolk Cricket League Division 2 West.